January 15, 2016 – Today’s history author, Jean Edward Smith, author of Grant , discusses the life and legacy of Ulysses S. Grant, from great disappointments and outright failures, to Civil War battlefields and, ultimately, the White House. The book bears a single word, the name of a modest man who became a legend. Grant. Frederick Douglas called him “the last of the radicals” and he wrote memoirs so beautiful that critics have called them some of the most beautiful works in the English language. 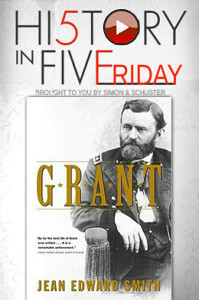 In this week’s episode, Jean Edward Smith shares with us five things you need to know about General Grant.